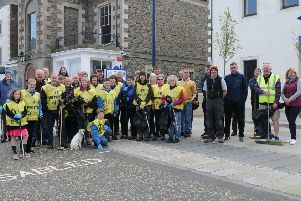 Community leaders in Peebles want to set up a task group to try to find a use for a historic textile mill – and are determined that the site will not be used for housing. March Street Mill, which was first in use in 1884, closed at the end of the year with the loss of 87 jobs. Peebles Community Council planning chairman Crick Carleton said: “No-one seems upset at the loss of the mill with the loss of jobs and we really need to maintain interest and focus on local opportunities. “What happens to the mill is material to the town and we should form a task group to look at what can and can’t be done. Tweeddale West councillor Stuart Bell said the site was designated as employment land and that it would have to would have to have a designated change of use – unlikely to be granted by the council – if houses were to be built.